We've lost count of the number of devices, utilizing Qualcomm's upper-midrange Snapdragon 615 chipset (though a quick free-text search in our Phone Finder returned 36 entries from our database alone). As you probably know, the chipset comes with a dual quad-core processor setup and in the case of the vivo X5Max the two clusters of Cortex-A53 cores are clocked at 1.5GHz and 1.0GHz for power and efficiency respectively. There are 2GB of RAM on board, when we're seeing a gradual move towards 3GB even in the midrange, though the real-life benefits of this are still debatable. We've already had the opportunity to test a bunch of similarly equipped devices and had a general idea what to expect. We have picked out the more-popular of those and it turns out implementing and utilizing the said Qualcomm chipset is still a challenge for a lot of vendors. Results vary greatly, but a lot of that can also be attributed to custom OS overlays. For a broader comparison we have also thrown in a few devices that you can pick up for around the same price as the vivo - the LG G3, HTC One E9+, Samsung Galaxy E7 and the Asus Zenfone 2. Others like the Huawei P8 are simply there because of their stylish exterior and design - a major selling point for the vivo X5Max. First up, we have the raw CPU performance test with GeekBench 3, which should be straight-forward enough. The eight Cortex-A53 cores inside the MSM8939 are by no means a bit-churning powerhouse, but have definitely proven themselves more than adequate in a lot of current devices. Yet, the Vivo X5Max doesn't seem to utilize them to their full capacity. As far as raw calculation goes, the handset falls behind most similarly equipped devices. Like we said, most of the performance drop can be attributed to poor software optimization and the custom OS. Still, we can see that ZTE has managed to do even worse with the Blade S6, powered by the same chipset. AnTuTu is a compound benchmark, which also takes into account RAM and GPU performance. Here, the vivo X5Max has held up quite a bit better. We can see it sitting comfortably between the recent Oppo devices - the R7 and R5, which is quite respectable, especially considering that the former is noticeably pricier than the vivo. Also, the AnTuTu scores do tend to paint a more-accurate "real-life" performance picture and we really can't complain from how the X5Max behaves under regular everyday use. Basemark OS II is another all-round benchmark, that for some reason the vivo X5Max doesn't seem to get along too well with. We see a really underwhelming overall performance score, with as much as 200 points of difference between the vivo and the Xperia M4 aqua. Even more worrying is that the handset barely surpasses the Galaxy E7, which is based on the Snapdragon 410 SoC. The detailed single-core and multi-core score only furthers this general vibe of underwhelming performance. Things look slightly better in the graphics department. The Snapdragon 615 comes with an Adreno 405 GPU. Again, we don't expect groundbreaking pixel-pushing from the mid-range chip, but it does fairly well. It is encouraging to see that frame rates are roughly identical across the array of devices, powered by the said SoC. There are, however, a few notable exceptions line the Xiaomi Mi 4i which has managed to squeeze about half a frame extra of the same silicon, but that is well within the margin of error. And if you are wondering why the onscreen charts seem to be topped by The HTC Desire 820 and the Xperia M4 Aqua, the explanation is simple - half the screen resolution at 720p. As far as browsing performance goes, the vivo X5Max does fairly well, as long as you stay away from the stock browser. Chrome does come bundled, so really there is no reason to even consider vivo's solution, which offers almost intolerably low performance. 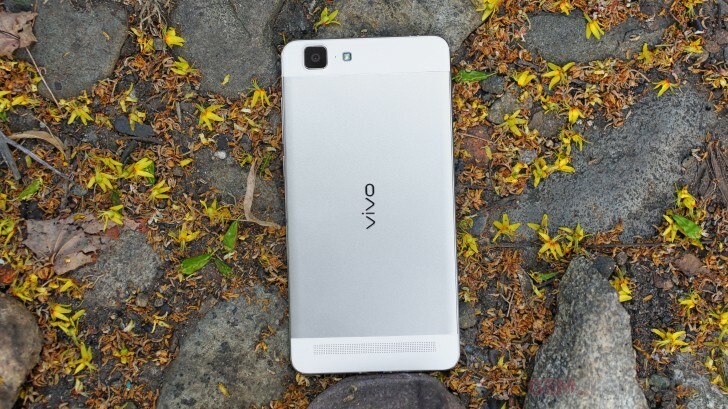 All things considered, the vivo X5Max seems to be more of a charmer than a heavy-duty worker. Don't get us wrong, the Snapdragon 615 and Adreno 405 combo is plenty to get you through any everyday task. However, if you are looking to squeeze the most out of the mid-range platform you are paying for, there are definitely other manufacturers who have done a better job of integrating the silicon. Still, if it is looks you are after, it is hard to beat the attractive exterior that vivo has crafted.